As an Owens Corning Roofing Platinum Preferred Contractor, M&M Home Remodeling Services attended the 2018 Owens Corning Roofing Platinum Conference. 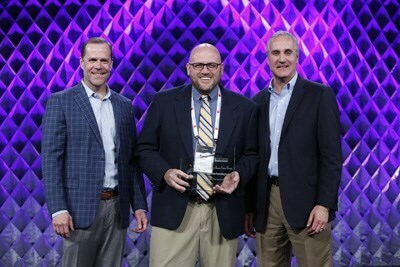 At the national event, we were honored with Top Performer Platinum Protection Warranties Award for our company’s industry-leading contributions to the roofing category. This industry recognition reflects our continued focus on bringing a results-oriented, customer-driven approach to running our business and delivering trustworthy, dependable work for Chicago and Indiana homeowners. Pictured: Gunner Smith, Owens Corning Roofing and Asphalt Vice President, Building Material Distribution Sales, Nathan Napier, Director of Sales, M&M Home Remodeling Services, Brian Chambers, Owens Corning Roofing and Asphalt President.